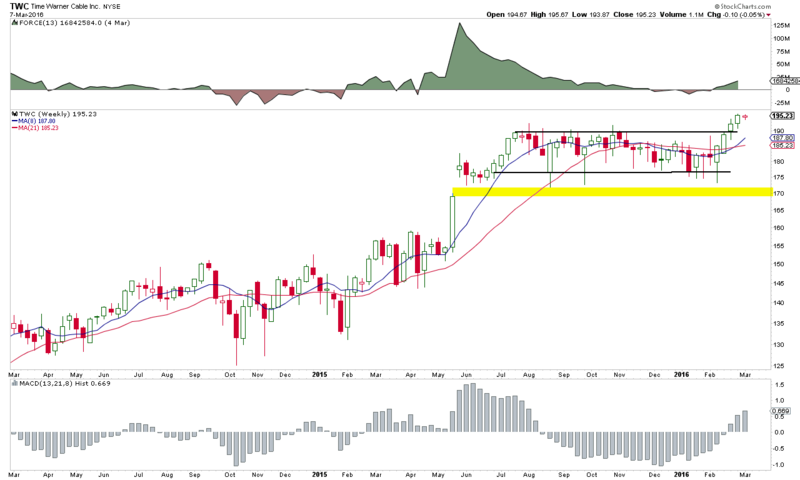 The monthly chart demonstrates everything we want to see in a bullish chart. Jim Cramer featured the technical analysis of Real Money contributor Tim Collins during Mad Money's "Off the Charts" segment Tuesday. Collins took a look at the charts of Time Warner Cable (TWC and was very encouraged by what he saw. First, video killed the radio star and now streaming kills the cable guy. Or at least that's the thesis. If we examine the price performance of Time Warner Cable to that of Netflix (NFLX - Get Report) , the first thought that comes to mind is how poorly cable is doing. Time Warner has underperformed Netflix by 55% in terms of price over the last four years. So, we can conclude cable is indeed dying, if not dead, right? Looking at TWC over the past four years, it seems the stock didn't get the memo. 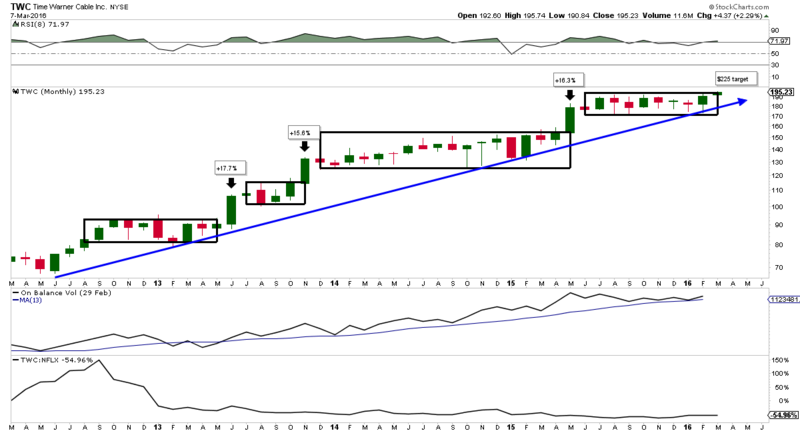 The monthly chart of TWC demonstrates everything we want to see in a bullish chart. Price marches from lower left to upper right. Pullbacks are contained and breakouts are held. This is a picture-perfect trendline. But it isn't just the trendline that makes this chart a classic. Note on the move higher how we have these boxes of consolidation followed by a big push higher and it's repeated consistently for four years. The past three breakout moves have all occurred within a single month's timeframe, with large moves ranging from 15% to 17%. The challenge is catching the move as it happens quickly and on the break of the previous box. We're early in the month, but Time Warner appears to be set up for one of these potential moves. The benefit of these boxes is they outline support and resistance. If we get a monthly close under $175 or a violation of $167.50 then the bullish thesis is dead. While it may not be bearish, it would be neutral. The upside target here is $225 minimal. Price is getting a boost from a strong RSI here, which hasn't spent more than a month under 50 for the past four years. Also, we see a fairly consistent buying pattern in the On Balance Volume here for the past three years. Overall, I don't see anything on the long-term chart to change the bullish thesis despite cord cutting. Zooming in on the weekly chart gives us a closer look at that monthly breakout and while it might be worth consideration here. TWC is pushing out from a consolidation channel dating back to summer of 2015. We have the eight-week simple moving average pushing above the 21-week SMA. The stock has performed well after these crossovers. Again, we see the MACD bullish here indicating trend favors the bulls and after a short period of consolidation, volume, as indicated by the Force Index, is also bullish. The concerns here are twofold. First, a close under $190 places us right back in that channel. While that's fine for the longer-term look of things, no one wants to buy at $194 and watch a stock consolidate between $177 and $190 for weeks afterward. So, watch the $190 price on the weekly close. Second, we still have an open gap to fill back to $170. While it isn't much of a concern now, if we get back under $190 it will grow in terms of worry. Should we close under $177, then I would expect a quick gap fill. Overall, I see this as one of the most favorable long-term charts in the large-cap arena. The downside is well defined and the upside looks to be in the $25-$35 area. Sitting back and watching this one climb over $225 might just be the best show on cable for the next six to 12 weeks.